Through the invitation of Philippine Business for Social Progress, ATN supported the Department of Education’s Brigada Eskwela 2011. Brigada Eskwela is a nationwide concerted effort of parents, teachers, students, volunteers, organizations and the business sector in school preparations. In responding to both strategic and immediate educational needs of our country, the ATN volunteers went to Bagong Silangan Elementary School, 2nd District, Quezon City, on 21 May 2011 to donate cleaning materials and to participate in the cleaning of classrooms. Bagong Silangan Elementary School is second home to almost 7,200 pupils and 152 teachers. Most of its pupils are residents of Barangay Silangan and nearby communities like Brgy. Payatas and Brgy. Batasan Hills. 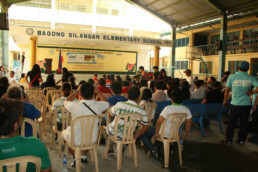 Joining Brigada Eskwela 2011 was indeed a meaningful and memorable experience for all the ATN volunteers.